A Protest in Wellington and the 20th Biennial Conference on the Biology of Marine Mammals in Dunedin both warn against weak proposal to mildly extend set net ban. 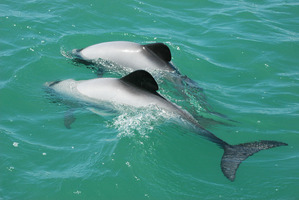 However Taranaki Fishermen hope that a court case brought by International Conservation against the NZ Govt.’s weak changes to set-net ban region within what is understood to be Maui’s Dolphin habitat, will undermine the same current ban. These Fishermen continue to claim scientific evidence is falsified or misrepresentational (as is an industry standard seen throughout recent times, including through the Orange Roughy collapse) despite the lack of a motive or opposing evidence. The restrictions extend a ban on using set nets by 350 square kilometres off the Taranaki coast. Dr Smith’s restrictions mean set nets will be banned up to 13km offshore between Pariokariwa Pt and the Waiwhakaiho River in Taranaki, a 350sq km increase to existing net restrictions running along the west coast of the North Island from Maunganui Bluff, near Dargaville. The Ministry for Primary Industries estimated the measure would cost New Plymouth fishers $81,000 each year. The German conservation group, NABU International, says it will mount a legal challenge because the restrictions don’t go far enough. Egmont Seafoods says it expects a judge will find the rules are too restrictive and that NABU has presented misleading information to the International Whaling Commission. The WWF is also considering challenge to dolphin rules, joining NABU in a legal challenge to the new rules set-net ban, saying the new restrictions are damaging to New Zealand’s international reputation. WWF head of Campaign head Peter Hardstaff argues the dolphin’s habitat extends well beyond that and the ruling sends the wrong message. Conservation Minister Nick Smith has refused to comment on any possible legal action and says that Government stands by its measures to protect the dolphin. Meanwhile the world’s largest marine mammal conference of about 1100 marine scientists and conservationists attended the 20th Biennial Conference on the Biology of Marine Mammals, which began in Dunedin on Monday were warned that Maui’s dolphin is headed for extinction. Professor Steve Dawson from Otago University told those gathered that the Government is unwilling to restrict economic activities, such as fishing, unless it absolutely has to. Professor Dawson said it is trying to get compromises that science shows are not achievable and the lack urgent action to save the Maui’s dolphin is an international shame. Conference organisers say human activities at sea and in rivers are posing an increasing threat to marine mammals. Earlier this year, they wrote to Conservation Minister Nick Smith asking him to extend a netting ban to cover the entire range of the Maui’s dolphin’s habitat. Nick Smith announced in late November that the Government would extend a set-net fishing ban off the Taranaki coast, but this is not an immediate measure and it also miserably fails to encapsulate the Maui’s habitat. Also this month public response has grown to the NZ Govt.’s lack of leadership and commitment to the conservation of Maui’s Dolphin. 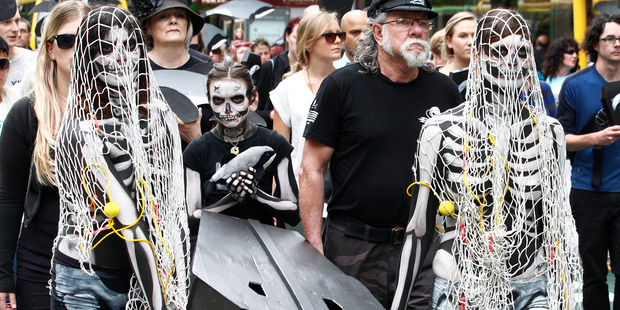 In Wellington on the 4th of December about 100 activists have staged what they call a “funeral procession” through central Wellington to protest a lack of Government protection for Maui’s dolphins. 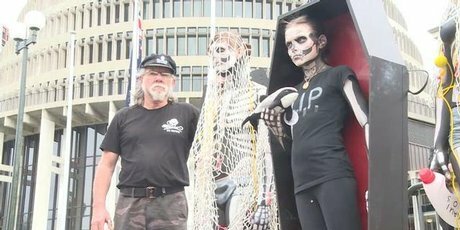 Campaigners protested New Zealand’s set-net fishing restrictions saying that they are a death sentence for the Maui’s dolphins, they marched to parliament and laid cardboard coffins and fishing nets full of plastic junk outside Parliament. A ‘funeral procession’ for the endangered species, held in Wellington, ended in an emotional gathering on the steps of Parliament. It is now believed there are fewer than 50 of the dolphins left in the world. The protest was organised by the Maui’s and Hector’s Education/Action group and the Berlin-based Nature and Biodiversity Conservation Union, to protest Conservation Minister Nick Smith’s proposed extension of set net restrictions as too small to guarantee the survival of the Maui’s dolphin species. Maui’s and Hector’s Education/Action group chairwoman Christine Rose said today’s protest showed how angry people were about the Government’s attitude towards the world’s rarest, smallest and loveliest marine dolphin. “We’re angry, but there is hope. We know based on the best scientific evidence that if we remove those human-induced threats from the Maui’s habitat, that they can recover to half their 1970 population by 2030. They can recover,” Ms Rose said. Ms Rose said the species can cope with only one death every 10 to 23 years, but about five Maui’s dolphins die due to human activities each year. Labour MP Ruth Dyson, who was among a group of politicians which met the protest march outside Parliament today, said economic impacts of fishing restrictions needed to be set aside when making conservation decisions about Maui’s dolphins.